aha Bingo Casino will then reward you with a bonus (Welcome Bonus is for new players only). The terms and conditions of the bonuses vary between different casinos and might also change over time and between different countries, so it is important to compare the different offers and read the T&C for aha Bingo Casino before signing up. As soon as you enter the AHA Bingo website, you will easily understand that it caters to Scandinavian players. Its main language is Swedish and you can change it to Norwegian. Though its name suggests that the gaming venue offers Bingo games, here you can enjoy much more than that. Despite its simple layout, the gambling site offers modern slot games as well as table games provided by young yet successful gaming companies. The casino is owned by the Malta-based online gaming operator AHA Bingo Limited and as such holds the license issued by the Malta Gaming Authority. In addition, it is authorised and regulated by the Government of Curacao, an institution that also confirms that the gaming venue operates according to a set of strict industry standards. Knowing this, you can relax and focus on the gameplay without worrying about fairness and security. AHA Bingo Casino runs on a multi platform and can be accessed instantly with no download needed. Whether you prefer playing casino games from the comfort of your home or on the go, the gaming venue will provide you with an exciting gaming experience on your desktop or mobile device. Its portfolio is powered by some of the most successful new kids on the block such as Yggdrasil, ELK Studios and iSoftBet. Frankly speaking, the games collection available at AHA Bingo Casino is not the most diverse you will find on the web and it definitely lacks the titles from some of the biggest online gaming companies. Nevertheless, it will provide you with a fresh gaming experience with slot games boasting impressive visuals and sounds that will keep you entertained for a long time. Besides Bingo games and slots, the gaming venue offers virtual table games offering some real casino action. At first, you may be a bit confused by the online casino using Swedish and Norwegian, but you will easily find the Casino section divided into three categories only – Slots, Table and Games. We really like slots offered by AHA Bingo as they look great and offer thrilling and potentially lucrative bonus features. Yggdrasil established itself on the market thanks to slot games bragging outstanding graphics and animations followed by cinematic soundtracks and the same goes for ELK Studios and iSoftBet. At AHA Bingo, you can take your chance on the highly popular titles like Vikings Go to Hell and Valley of the Gods by Yggdrasil, Taco Brothers or Birthday by ELK Studios or branded slots like Paranormal Activity or Basic Instinct from the iSoftBet creative kitchen. A decent table games collection awaits all players looking for more traditional gaming experience. Baccarat, Blackjack, Roulette 3D, Casino Hold’em and Stud Poker are some of the table games on offer at AHA Bingo. Bingo. It’s all about Bingo here and you can enjoy this type of games in bingo rooms such as Parasol and Bingomix. Besides Bingo, visitors can play Video Poker variations such as Jacks or Better or 10x Deuces Wild. These games can be found in the Table section too. Unfortunately, aha Bingo offers no live dealer games. Just like the collection of casino games, the list of banking options supported by AHA Bingo is quite limited. To make your deposits and withdrawals, you can use Visa, MasterCard and bank transfer via Trustly. 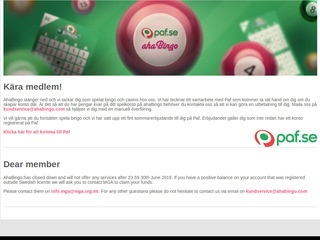 As for currencies, the casino focusing on Scandinavian players accepts deposits in SEK, NOK, DKK, CAD and EUR and you cannot make transactions or wagers in any other currency. The last page in the main menu is where you can find help in case you need it. It may seem odd to read FAQ in Swedish or Norwegian, so you can translate the content if you access the gaming venue through Google Chrome. In case you cannot find a solution to your problem this way, you can look for professional assistance via email using the address [email protected] from 08:00 to 24:00 Monday to Friday and between 10:00 and 24:00 Saturday and Sunday. Customer support via phone is also available and you can use it from 10:00 to 22:00 Sunday to Thursday and from 10:00 to 23:00 Friday and Saturday. The telephone number is 0774100040 and costs of calls will be charged depending on the country you call it from. When it comes to live chat, it is not available 24/7 either. Instead, you can reach agents via live chat from 10:00 to 24:00 every day. Don’t forget that you can also use chat rooms to pose your question and the AHA Bingo Casino staff will get back to you.